5.2 Earthquake hits off the coast of Oregon, USA. 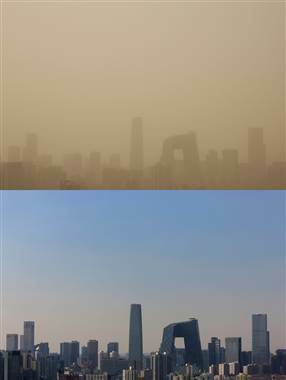 Beijing and other parts of northern China were stung by hazardous air pollution levels Thursday as strong winds blew a sandstorm through the region. Air in the capital turned a yellowish hue as sand from China’s arid northwest blew in, turning the sky into a noxious soup of smog and dust. Beijing’s municipal government issued a yellow-haze warning late Wednesday while state media urged citizens to stay indoors or to take precautions such as donning face masks before venturing outside. Stromboli (Eolian Islands, Italy): The seismic signal signal has increased and probably shows both increased tremor and continuous rockfalls on the Sciara del Fuoco. Activity has increased significantly, judging from visible and seismic data. Small overflows of lava are again occurring from the NE crater and tremor is at comparably high levels. Etna (Sicily, Italy): Today, we observed an eruptive episode characterized by strombolian explosions and ash emissions took place from a new “player”, the Voragine summit crater (NOT Bocca Nuova). The New SE crater has stayed calm, but now at night, an incandescent fumarole and some glow from its crater are visible (although the latter could still be from the Voragine). Santa María / Santiaguito (Guatemala): No changes in activity occurred at the volcano, which continues to produce small to moderate ash explosions from the dome and weakly alimented block lava flows on its flanks. Pacaya (Guatemala): INSIVUMEH reports that the small explosions have ceased for now, but expects strombolian activity to resume soon, as the seismicity remains elevated. Fuego (Guatemala): Weak to moderate strombolian explosions with ash plumes rising about 600 m and drifting for 10 km were reported today. Nevado del Ruiz (Colombia): Increased SO2 emissions are visible today. Sabancaya (Peru): (26 Feb) A strong seismic swarm and increased fumarolic activity triggered an eruption warning for Sabancaya volcano (Arequipa, Peru) and the Civil Defense of the Regional Government of Arequipa raised the alert level to yellow, which involves implementing actions to prepare for a probable volcanic eruption. On 24 Feb INGEMMET reported a seismic swarm with 536 earthquakes between 22 and 23 February (more than 20 per hour) and continuous fumarolic emissions from the volcano. Rusty made landfall in Pardoo town in Western Australia. A red alert has been issued by Australia’s Department of Fire and Emergency Services for Pardoo and nearby Whim Creek. Similarly a blue alert is in effect between Nullagine and Newman. Three main iron ore ports (including Rio Tinto and Fortescue Metals) in the Pilbara region (also the world’s largest source of iron ore) were closed, but Port Hedland has escaped the brunt of the cyclone. Tropical cyclone Rusty is forecast to bring rain to most parts of the Goldfields from today. Rusty is the third tropical cyclone in Western Australia this season. A tornado between Harbour Island and Davis Island in Tampa, Florida has damaged vehicles and roofs of several houses. Recent floods in Agusan del Sur have killed one and affected 49,000 persons. Floods across Veruela, San Luis, Sta. Josefa, La Paz, Prosperidad and Loreto have also destroyed agricultural croplands. A wildfire has burned a 406-acre area east of Lone Pine, California. Nearly 500 firefighters are struggling to control the blaze. 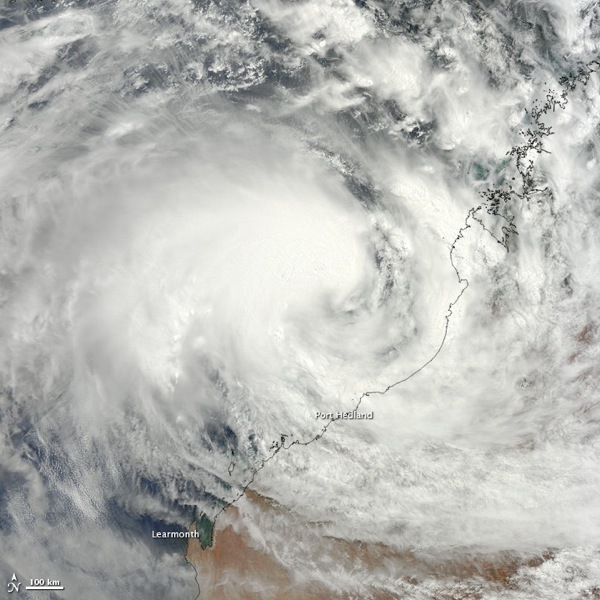 Tropical Cyclone Rusty was located approximately 70 nm north-northeast of Port Hedland, Australia and has been stationary over the past six hours. Australia’s north-west coast is being buffeted by high winds, hours before the powerful cyclone is expected to make landfall as a category four storm. Weather experts say that the slow speed of Cyclone Rusty is likely to prompt extensive flooding. As much as 600mm of rain (24in) was being forecast over a 24-hour period, the equivalent of Perth’s entire winter rainfall could fall in just three days. Heavy rainfall has flooded around 300 homes in Josifovo, Macedonia. Floods in Macedonia have also destroyed two bridges. Around 20,000 people in Sveti Nikole are without electricity. Torrential rains have killed four people in Kigali, the capital city of Rwanda. Floods also damaged roads and bridges in Kigali. Landslide in Mati City, southern Philippines has killed three people. Search and rescue operations are ongoing in the Tagabacid area in Davao Oriental. Flash floods have affected people in Kuala Krai, Pasir Puteh, Tanah Merah in Kelantan and Setiu in Terengganu. All nine schools in Rantau Panjang will be closed tomorrow. Floods in Malaysia are regular natural disasters which happen every year during the monsoon season. Thailand authorities in Trang province have issued a ban on people playing in six different waterfalls due to concern of flash floods. Kachong and Toneplew waterfalls (Na Yong), Sairung waterfalls (Yan Ta Khao), Toete, Tontok and Lamploke waterfalls (Palian) are on alert. Recent winter storms in Woodward have killed one person. Winter storms have caused blizzard conditions in Oklahoma, Texas and parts of Kansas. A state of emergency has been declared in northwest Oklahoma. 5.4 Earthquake hits the Kamchatka Peninsula, Russia. 5.0 Earthquake hits southeast of the Ryukyu Islands off Japan. Etna (Sicily, Italy): For now, Etna has stayed quiet. It seems that – if the series continues – the intervals between paroxysms are getting again longer. Kizimen (Kamchatka): Lava effusion and dome growth continue accompanied by moderate seismic activity. Shiveluch (Kamchatka): KVERT reports only weak seismic activity today, indicating the volcano is in a phase of lower activity. Tolbachik (Kamchatka): The eruption continues with little changes. Lava erupts with strombolian activity at the vent on the southern fissure at 1600 m altitude and continues to feed the vast lava flow field that sttreches until the cinder cone Belaya Gorka, 15 km to the west from the vent. Some lava flow fronts to the east were also visible on recent MODIS images. The process is accompanied by stable and still high, although somewhat decreasing levels of tremor. White Island (New Zealand): Over the weekend, the active vent began producing ash. During a visit yesterday, the crater was found quiet again. Ash emissions had ceased and were replaced by steam and gas explosions from the active vent. Tremor has dropped again to low levels at the same time. 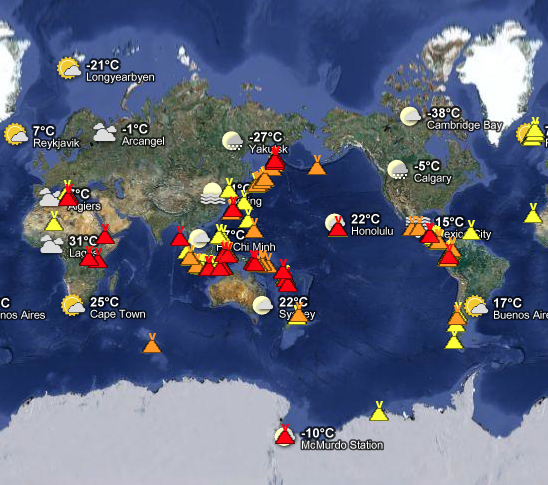 Strong continuous volcanic tremor has returned and is now higher than ever, mixed with earthquakes. No unusual activity is visible at the surface. Popocatépetl (Central Mexico): No significant changes in activity have occurred. The rate of steam-gas emissions has risen to almost 2 per hour, with some producing small puffs of ash. 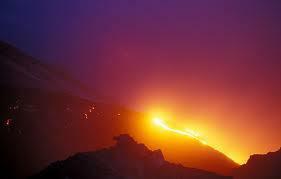 Incandescence from the crater remains visible at night. Santa María / Santiaguito (Guatemala): Weak to moderate explosions generate light ash plumes that drifted to the east towards the las Aldeas Belén and Calaguache areas. The lava flows at the flanks of the dome produced constant avalanches, INSIVUMEH reports today. Pacaya (Guatemala): The re-awakening of the volcano progresses: Today, INSIVUMEH reports some weak, perhaps strombolian explosions that ejected some material above the Mackenney crater. No further details about this activity were given. Fuego (Guatemala): Mild strombolian activity continues, with incandescent pulses of about 100 m heigh and ash plumes rising up to about 700 m above the crater. Sangay (Ecuador): (25 Feb) VAAC Washington reports pilot observations of ash emissions to 25,000 ft (7.5 km) altitude on 22 February. Since the volcano is very remote and one of Ecuador’s most active, it is fair to assume that it might be in a state of elevated activity. Heard (Australia, Southern Indian Ocean): (25 Feb) A MODIS hot spot was visible yesterday at the summit of the volcano, despite the usual dense cloud cover. This indicates that some sort of activity likely continues. 5.4 Earthquake hits the southern Pacific Ocean. 5.4 Earthquake hits southeast of the Ryukyu Islands off Japan. 5.3 Earthquake hits the Santa Cruz Islands. 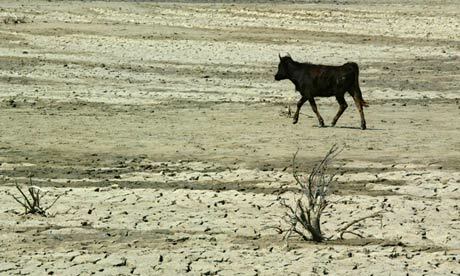 The Northern Hemisphere has taken a beating from extreme weather in recent years — the 2003 European heat wave, the 2010 Pakistan flood and the 2011 heat wave in the United States, for example. These events, in a general sense, are the result of the global movement of air. Giant waves of air in the atmosphere normally even out the climate, by bringing warm air north from the tropics and cold air south from the Arctic. But a new study suggests these colossal waves have gotten stuck in place during extreme weather events. A recent study found is that during several recent extreme weather events these planetary waves almost freeze in their tracks for weeks. So instead of bringing in cool air after having brought warm air in before, the heat just stays put. How long these weather extremes last is critical, the researchers say. While two or three days of 86 degrees Fahrenheit (30 degrees Celsius) pose little threat, 20 days or more can lead to extreme heat stress, which can trigger deaths, forest fires and lost harvests. The researchers created equations to model the motion of the massive air waves, determining what it takes to make the waves plough to a stop and build up. The team then used these models to crunch daily weather data from the U.S. National Centers for Environmental Prediction. During extreme weather events, the waves were indeed trapped and amplified, the scientists found. They also saw a significant increase in the occurrence of these trapped waves. Here’s how the waves may be getting trapped: The burning of fossil fuels causes more warming in the Arctic than in other latitudes, because the loss of snow and ice means heat gets absorbed by the darker ground, not reflected (as it would by the white snow). This warming lessens the temperature difference between the Arctic and northern latitudes like Europe. Since these differences drive air flow, a smaller difference means less air movement. Also, land areas warm and cool more easily than oceans. 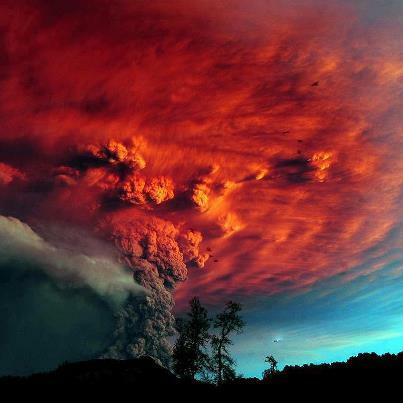 The result is an unnatural pattern of air flow that prevents the air waves from circulating over land. The study’s results help explain the spike in summer weather extremes. Previous research had shown a link between climate change and extreme weather, but did not identify the mechanism. “This is quite a breakthrough, even though things are not at all simple – the suggested physical process increases the probability of weather extremes, but additional factors certainly play a role as well, including natural variability.” The 32-year period studied provides a good explanation of past extreme weather events, the researchers say, but is too short to make predictions about how often such events may occur in the future. 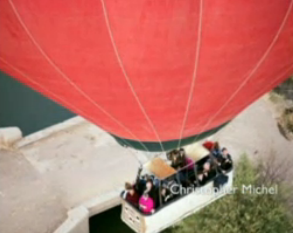 Three Britons have died and another is in hospital after a hot air balloon crashed near the Egyptian city of Luxor. Reports suggest 19 people were killed, with French, Hong Kong and Japanese nationals also among the dead. The balloon was at 1,000 ft (300m) up when it exploded, caught fire and plunged on to agricultural fields west of Luxor, officials said. TC Rusty has intensified to a Category 1 storm, it has an eye spanning 20 nautical miles, and is expected to unleash a significant storm surge in northern Western Australia. Authorities are warning residents in low lying areas to evacuate with a threat of flooding, high winds and a coastal tide. The Pacific Highway remains cut between Kempsey and Clybucca, and again near Grafton, as floodwaters take time to subside on the New South Wales north and mid-north coast. While the towns in this region have mostly been spared, large swathes or agricultural land is under water and herds of livestock are crowded on to small islands. Eight river systems along the coast are in flood but all are steady or falling. In the 1950s, major flooding in the region saw many farmers walk off their properties and never return. Authorities hope the same thing will not happen to this generation of farmers. Flooding in Mozambique has now displaced more than 238,000 people. Zambezi and Limpopo rivers have burst their banks and caused more flooding. More than 186,000 people are currently living in evacuation centres. Quarter-size hailstones have been reported in New Orleans, Louisiana. No reports of significant damage. 5.7 Earthquake hits eastern Honshu, Japan. 5.6 Earthquake hits off the coast of Hokkaido, Japan. 5.2 Earthquake hits south of Alaska. 5.2 Earthquake hits western Xizang, China. 5.2 Earthquake hits Kepulauan Barat Daya, Indonesia. 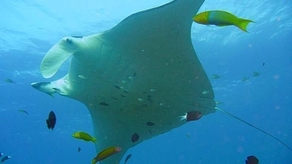 Queensland researchers have spotted an unusually large group of manta rays in a feeding frenzy near Lady Elliot Island. Up to 150 manta rays were feeding in the area last month, the most ever recorded. 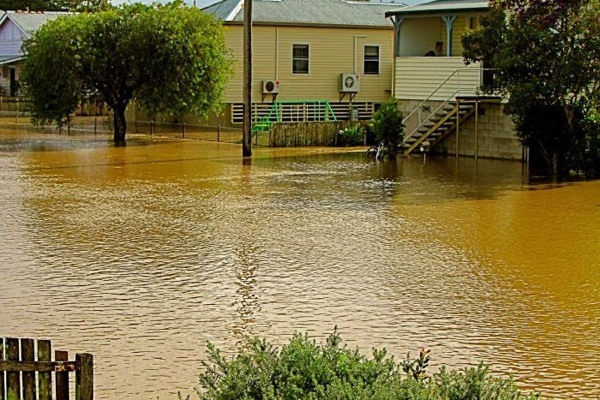 The phenomenon was a result of recent flooding in Bundaberg, with excess levels of water sending a surge of nutrients into the ocean, leading to a spike in plankton.